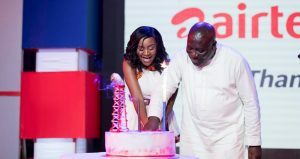 The country’s second-largest telecommunications operator, AirtelTigo has held a stakeholders’ dinner to celebrate its first anniversary with a commitment to creating a clear customer experience in the industry and better the lives of Ghanaians through the use of Information and Communications Technology (ICT). Themed ‘Thank You’, the stakeholders’ dinner was well attended by government officials, distribution partners, technology partners, vendors, financial inclusion and information communications technology partners, employees, media and other dignitaries at the Movenpick Ambassador Hotel in Accra. She applauded the Ministries of Communications, Finance, National Communications Authority, Bank of Ghana and other stakeholders for believing in the company’s ambition to do something that has never been done in the history of the Ghanaian telecommunications industry. The Honorable Deputy Minister of Communications, Vincent Sowah Odotei, who read a speech on behalf of the Minister, Mrs Ursula Owusu-Ekuful as a guest of honour congratulated AirtelTigo for its key milestone. He disclosed that the Minister is happy that many more of our people in our rural communities can equally enjoy the improved network services and the many benefits that the AirtelTigo one big network presents. “I would like to reiterate the value of quality telecommunications access and service to Ghana’s development agenda which makes AirtelTigo’s network integration and upgrade exercise a welcoming project indeed,” he told the stakeholders.